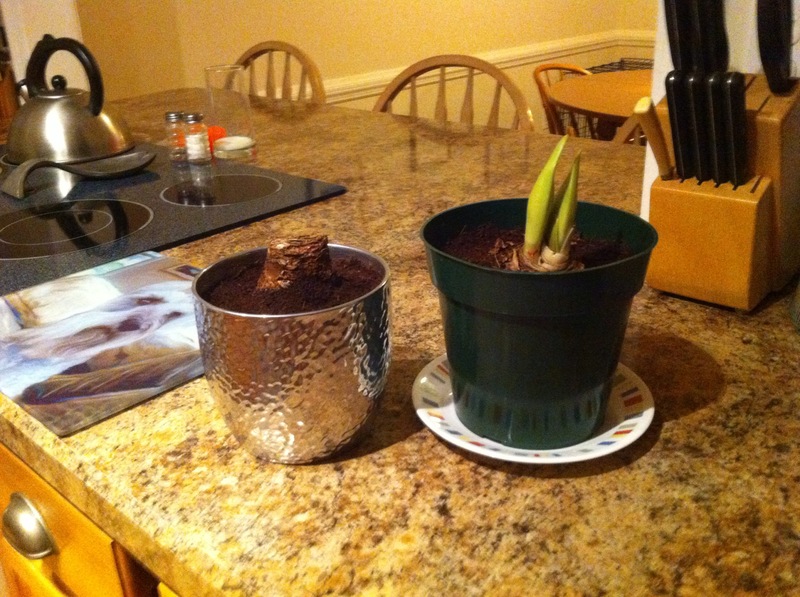 A friend of mine gave me an amaryllis bulb just before Christmas. I watered it, gave it light, moved it to a new spot, talked to it…nothing. I thought I saw a little bit of green, but no. He gave me another one that was sprouting already. I have been giving it the same treatment, and it seems to be slowly growing. I don’t have a green thumb when it comes to indoor plants; yet for some reason, it feels important to me that I get one of these bulbs to bloom. I don’t want to fail them. I feel a responsibility for their floral lives. So God is in all things, right? Where is God in these bulbs? Why does one grow and the other doesn’t? That’s what life does. It’s like the bulbs are different aspects of my life. Sometimes I water, water, water. I give something lots of attention, try different things…nothing. You know that feeling of wanting so much for something to go right and it just doesn’t work out that way? It’s annoying. You think you’re doing everything right. Why is it not working? It makes you start to doubt yourself and your abilities. Maybe I’m not cut out to force bulbs. But then there’s bulb #2. I did not have high expectations. Here we go again. Let’s see how many of these bulbs I can kill. I half-heartedly watered, put it next to a window and tried to ignore my hopes that it would grow. It is a trooper! The green leaves are slowly fighting their way out of layers of root ball. I am amazed. It still hasn’t flowered yet, but it’s alive and kicking. I don’t even feel like I have tried very hard with this one. My life can be like this too. Some things just come naturally. Sometimes things just feel right without the expectation of needing them to be. Maybe it is work but it doesn’t feel hard, because I am drawn to doing it (as opposed to being driven). Or sometimes life unexpectedly turns a different direction, but it feels okay. Maybe I can grow plants after all. I think God is in both of the bulbs. Many times I hear that everything happens for a reason. I disagree. I don’t think we are God’s robots. God gave us free will. We are bulbs. Sometimes we make life-giving choices and we grow from them, sometimes we don’t and we still grow from them. Or not. Whatever the choices we make, we can see the meaning in them if we look through the eyes of faith. When we look back at our life choices, we can see how God is working in us from what grows and what doesn’t. And do you know what? Yesterday, the first bulb finally started to sprout too! So there is no clear-cut answer for what works in life and what doesn’t. But I’m convinced God is in all of it anyway. Wherever there is life and love, God can’t help but be a part of it. Once a month, we go down to New Jersey to attend our community’s prayer meeting. To cut cost on hotel, my family sleeps over a brother and sister’s home before or after the meetings. We sleep in their comfortable basement yet every time I wake up in the morning, I get this unfamiliarity. I have to take my whole bag to the bathroom, which I don’t do at home. I come up to their breakfast table wondering where will I get my tea or food which I usually and easily does in our kitchen back home. In all these unfamiliarity, I get to miss our home. Clark Kent is Superman. Peter Parker is Spiderman. Bruce Banner is the Hulk. Maria Mendoza is called Wonder Woman. I can go on and on and on. These superheroes become extra-ordinary from ordinary. A journalist changing into a flying super strong man. A teenage guy becoming a high leaping, wall crawling protagonist. A physicist being magnified physically and turn into a high level humanoid. An expected way to save the world. From ordinary to extra-ordinary. From zero to hero. From weak to strong. From needing a savior to being the savior. When the angel announced to Mary on how God would save us, it was just the opposite. During a meeting with Moses, God describes God’s self as I AM. So let’s imagine I AM creating the world in steps. FYI, the Church now sees creation as metaphorical – not 6 literal days. Finally, God rested, teaching us to stop and rest, savor the gifts of I AM. Genesis shows us God through creation’s beauty, its majestic evolutionary ways, its stars and black holes and – then – in several stories with some sweet, lovable, but misguided, egotistical people. Genesis is an amazing dance of human and divine – our likeness to yet chosen separateness from God. In this first book we see God yearning for humanity and humans not quite trusting in God’s providence. Eventually God chooses Abraham and Sarah, offering these two very old people the impossible – descendants as numerous as the stars. Thus, our ancestors in faith, the Hebrew people begin. (The Muslim people too but that story doesn’t unfold for many years.) God’s initial covenant sounds something like: I’ve chosen YOU to carry the message. I AM is all powerful (not that I’ll fix your every woe), nurturing, providing Teacher. I’ll LOVE YOU without limit, send prophets and elders galore, make you prosperous beyond your imaginings. All I ask in return is keep turning to me…NOTICE I’m here. THANK me for creation. RESPECT that I am your guide. And God sent deliverance from oppression, rules for the road, even a promised milk and honey land. Yet, God saw something special in young David, Jesse’s youngest boy, out there in the fields playing his lyre. So I AM thought, “This one just might make a truly great king.” David, like some humans, got full of himself and made some less-than-wise choices (Bathsheba). But, God’s teacher Nathan set David straight, and he turned to God (good move!) wisely and humbly saying, “I’m sorry. Please forgive me.” He wrote the top ten songs to God we call Psalms, and straightened himself out. So God gave David a brilliant son named Solomon who, again humbly, asked for WISDOM! God thought, “Good choice! Just maybe this king thing WILL work.” But Solomon got greedy and arrogant. He thought he’d be famous for THE BEST EVER TEMPLE for God and turned lots of God’s chosen people into slaves to build it. Then he taxed to death the rest to balance the budget. Not so wise. He also partied with concubines galore. Frankly, after that, hardly any earthly king could keep the Hebrew people close to God for a very long time. The rest of the Old Testament is full of nasty kings, partying and fighting and foolishly building gold statues to OTHER gods like Baal, messing with “sacred” prostitutes and even sacrificing children. BAD IDEA! Poor I AM is now sighing and frowning. Wouldn’t YOU be? God started sending prophets to say, “You don’t get it! Where’s the LOVE AND RESPECT God asks for? Where’s the help for the poor, widows, orphans? And what is it with these not-even-real gods! God commanded us to spread the word about I AM, the only one! Soooo finally God called some prophets to give a picture of what a truly great king looks like…NOT militaristic, NOT partying wildly (though he will have some good times with friends), NOT warring with factions, NOT overly stuck on himself or even on the law. God’s prophets warned the people and a lot of destruction came to wake the people up. Part of the message was “Imagine God sending a new kind of KING, as a shoot from Jesse’s tree, from the line of David, yes, but a king who will be about LOVE. Yes, LOVE of God and LOVE of others, especially the poor and downtrodden. Why, lions will lay down with lambs. Children will play with cobras. This King will be about justice and service and kindness and peace. THIS KING will GET GOD, see God as the Providential FATHER that I AM has always been for his people. Akin to David and Solomon and the better Kings (Hezekiah and Josiah), he will humbly lead like a Good Shepherd and bring back the lost of the fold. So God sent Jesus, who truly GOT GOD, who is God, who became GOD’s WORD to the world. Jesus’ whole life spoke of what God wants for and from his people – LOVE. God had made humans hard-wired for communal, loving living! God made them to be generous not greedy, service-minded not overly-selfish, hopeful not despairing. (Not that despair is wrong, it’s just a feeling.) God simply wanted people to TURN TO GOD. Jesus did. NOTICE I AM with you! Jesus did. CRY OUT for help. The humble, broken, Jesus did and showed us how to stay connected to God. Honor God as Father. Keep Holy God’s name. REST and turn back to God as the commandments long taught. Don’t get overly picky about humanly designed laws, lording them over those who struggle. Don’t cheat the poor. Walk with them. Stay humble. See the children as teachers of innocence and purity. Allow yourselves to be vulnerable. Depend on God. Turn to I AM for all your fears and needs. SEE the widows, the lame, the blind, the demonized. Never turn away in disgust or fear. Offer compassion toward the down-hearted. Lend a hand till they are out of trouble. Walk WITH them, as God has always walked with you. KNOW the Father. Be still and listen in prayer. Give thanks. Sing. Dance. Play the lyre, as David did. You don’t need another King. Remember my promise: YOU are MY PEOPLE and I AM your God. Your God rejoices in you! You are God’s Delight, God’s Espoused! How does this speak to you? When were you so full of joy you could not be quiet? The conferral of a new name designated God’s almighty power over creation. When one was given a new name, that person was made a new creation, (Birmingham, W&W, p. 88). Isn’t it endearing when someone calls you by a nickname? It draws you close to each other. God calls you by name, for you belong to God. Relish in it. In this reading, Paul is connecting the messianic promise in the Hebrew scriptures to its fulfillment in Jesus Christ. Paul wants to be sure his audience is listening to this message. Jesus came to save them – and us! Know that this Christmas. Jesus comes to us as a small child, unlike any image of Messiah anyone could have possibly imagined. But Jesus comes to us now, in our hearts. We must listen for it. Matthew begins with this genealogical lineage, almost like a commercial before the main event. It was so important to the people at that time to see a link between Abraham, the Father of their faith, and Jesus. The important link is Joseph, since he is Jesus’ legal father and heir to the house of David. The genealogy shows that God used ordinary, unknown men and women to be part of the greatest story over told. Not just unknown – some were downright scoundrels! David himself was no saint, and others were horrible kings. But everyone has a place in history. We all may have a sordid family tree – Jesus understands that! 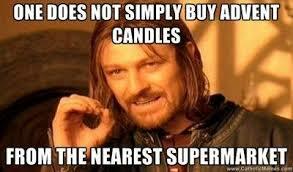 (Remember that when you are at your family gatherings this Christmas!) Jesus stands as a beacon of light in the midst of relational darkness, (Birmingham, W&W, p. 90). Jesus is the answer to the dreams of men [and women]. It is true that so often we don’t see it that way. We see the answer in power, wealth, material plenty and the realization of anticipated ambitions. But if ever our dreams of peace and loveliness, and greatness and satisfaction, are to be realized, they can find their realization only in Jesus Christ. Engagement: This was usually done when the couple were only children, through the parents or a matchmaker. Betrothal: This was the sealing of the engagement. The girl could withdraw up to this point. Once entered, it was binding and lasted a year. The couple would be called man and wife even though they didn’t quite have the rights yet. Only divorce could end a betrothal. This is the stage Mary and Joseph were in. Jesus is the Greek form of the Jewish name Joshua, meaning Jehovah is salvation. Jesus was born by the action of the Holy Spirit, a Virgin Birth. What does this mean for us? According to the Jewish idea, the Holy Spirit was the person who brought God’s truth to humanity. It was the Holy Spirit who taught the prophets what to say and what to do. This is how Mary and Joseph would have understood it. Jesus would be the one person who could tell us what God is like, and what God means us to be. In Jesus we see the love, the compassion, the mercy, the seeking heart, the purity of God as nowhere else in all this world. God takes on flesh so that every home becomes a church, every child becomes the Christ-child, and all food and drink become a sacrament. God’s many faces are now everywhere, in flesh, tempered and turned down, so that our human eyes can see him. God, in his many-faced face, has become as accessible, and visible, as the nearest water tap. That is they why of the incarnation. God is still here, in the flesh, just as real and just as physical, as God was in Jesus. The word did not just become flesh and dwell among us – it became flesh and continues to dwell among us.